Allow me to pose a question. What could be better than roller derby? That's right! MORE roller derby. I happened across an ad for another contest this Saturday between another local team called the Lava City Roller Dolls versus the visiting Slaughter County Roller Vixens. Oh such great delight. This event was different from the previous one. This was much more official: held in a real roller rink as opposed to a music venue, involving far more referees who seemed more concerned with accurate score tally, and having distinct rules and a penalty system. So the rules part kind of stinks, but absent the flagrant tripping and throwing, the general body checking and frequent pile-ups were all there. 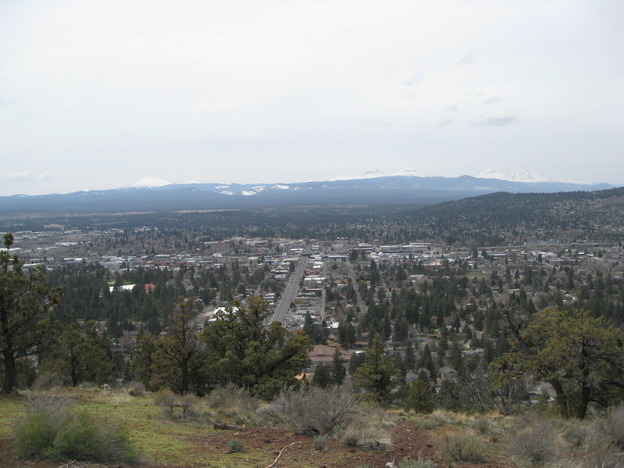 Today I walked up the nearby Pilot Butte and got a nice look across the town.